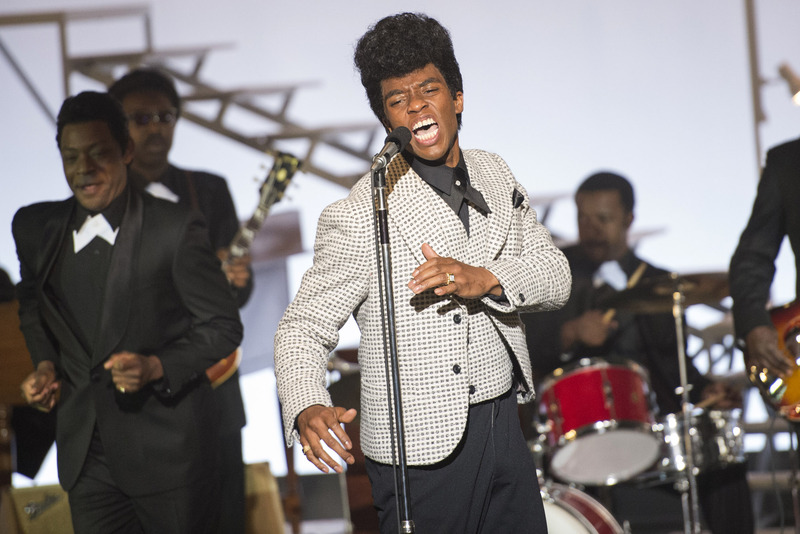 “Get On Up” is now playing at Point, Eastgate and Star Cinema. PG-13, 2:18, three stars out of four. 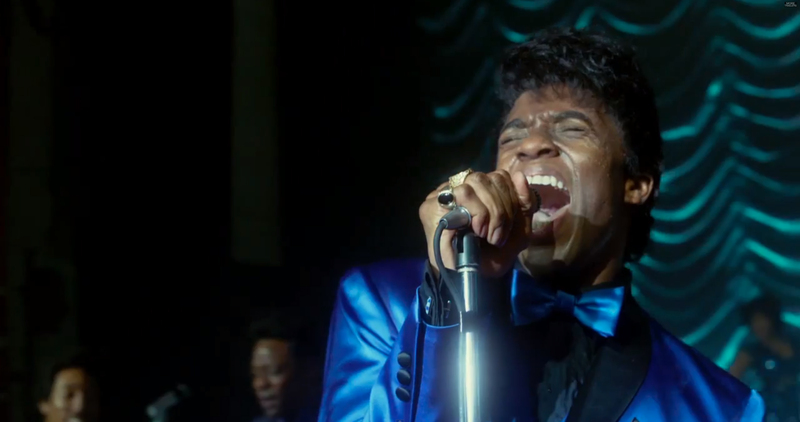 At first, watching the James Brown biopic “Get On Up” is like listening to his greatest-hits album on shuffle. First, we’re in 1988, when a track-suited Godfather of Soul fires a rifle into the ceiling at one of his businesses and is chased by police. Then we’re back in 1968, as Brown and his band flyon a transport plane to a show in Vietnam, enemy gunfire all around. (While his band cowers, Brown seems more offended than anything else that the Viet Cong might cause him to be late for the show.) Then we’re back in 1939, as a young Brown growing up poor in rural Georgia, the prize in a lifelong tug-of-war between his abusive parents. The effect is disorienting and exhilarating, especially for those used to the traditional arc of a biopic like “Walk the Line” or “Ray.” It’s as if James Brown’s life is simply too big to fit into a conventional structure, bursting at the seams with music and emotion, tragedies and triumphs. There’s no question that at times the film seems a little aimless, and certainly confusing to those not intimately familiar with the life of the Godfather of Soul. But it also leads to some exhilarating connections, such as a scene from 1965 where Brown is singing the politest imaginable version of “Get On Up” in a scene from a Frankie Avalon film called “Ski Party!” Mid-song, Brown looks around at all the white young faces clapping along around him, and thinks, “Aw hell no.” Cut to 1971, where Brown and his band are in Paris playing the sweatiest, sexiest, dirtiest version of the song imaginable. It’s as if Brown’s life was one long groove, and he always stayed deep in the pocket no matter where he was. The film simply couldn’t work without a convincing Brown, and Chadwick Boseman (who played Jackie Robinson in “42”) is, no lie, phenomenal. The recreations of Brown on stage at different phases of his career — the hungry young man playing roadhouses, the soul trailblazer of the late ’60s and ’70s, the imperious Godfather of Soul in the ’80s — is absolutely perfect. But he’s even more magnetic between the shows, as Brown is a complicated, driven, at times shockingly cruel man. In the end, “Get On Up” doesn’t try and redeem the man or make him palatable to us; the iconic image we see of Brown is him, walking alone down a hallway backstage in a crimson suit, his jaw set, moving to a rhythm only he can hear. Then the curtains part, and his face is flooded with white light and screams from the audience. It seems the closest anybody ever got to him is when they bought their ticket and saw him on stage. ← “Guardians of the Galaxy”: A guy, a girl, a wrestler, a raccoon and a tree walk into a bar . . .